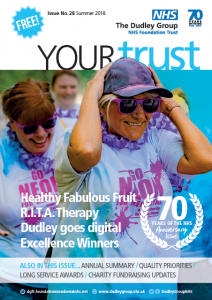 Your Trust magazine is packed with with news, features and pictures, and keeps our staff and members up-to-date with what’s happening at The Dudley Group. We’re always looking for ideas for new articles and we’d love to hear from you about what you’d like to see in future editions. You can view previous editions of Your Trust by clicking on the links below.